The Rise of Skywalker has now been unveiled for the world to see. In addition to the official title and first trailer, we have also been given the first poster for the movie. There isn't a whole lot going on in the poster, but it does confirm the blue logo, which was teased a few weeks ago. 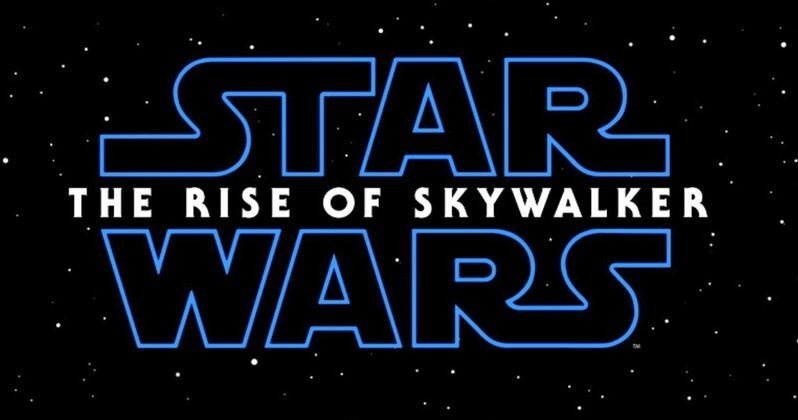 The poster features the classic Star Wars logo with The Rise of Skywalker written in white across the middle. It's a classic look, which will be followed up with a ton of posters in the near future. Even after seeing The Rise of Skywalker trailer and receiving the title, we're still in the dark as to what the story will really be about. During the Star Wars Celebration panel, director J.J. Abrams revealed the Resistance crew will be together on a mission, but he obviously did not go into specifics, no matter how hard host Stephen Colbert tried to get it at of him. Regardless, the trailer has a lot to unpack and fans seem to be enjoying it. Out of everything, Star Wars fans were more than likely most excited to hear the voice of Emperor Palpatine show up at the very end of The Rise of Skywalker trailer. Luke Skywalker's voice can be heard saying, "no one is ever really gone," and then Ian McDiarmid's cackle rings out. It's still a mystery as to how the villain returned, but Abrams hinted the Resistance is going to have to go up against their biggest threat yet, which makes sense now that we know Palpatine is back. Another highlight from The Rise of Skywalker trailer is the return of Carrie Fisher. Star Wars fans have been wondering how much J.J. Abrams and crew were going to be able to bring her back in a meaningful way using only unused footage from 2015's The Force Awakens. We're still not entirely sure, but Abrams says the actress, "lives in the movie," and he was shocked at how much they were able to include her. The trailer shows a hug between Leia and Rey, but that's the only footage shown so far. With the Star Wars 9 title, trailer and poster reveal, fans are going to have a lot to examine over the next few weeks. As for J.J. Abrams, he goes right back into the post-production process where they are currently editing and finishing the digital effects. As the director said on stage earlier today, "the directing doesn't stop," when the cameras stop rolling. There's still a lot of work to be done and hopefully showing off the first footage has been a weight off of Abrams' shoulders. The director has a ton of pressure on him to end the Skywalker saga in the best possible way. You can check out The Rise of Skywalker poster below, thanks to Star Wars.